The free 32 Things You Can Do to Improve Your Career template is the best way to start improving both your resume and yourself for future employ. This simple list of items will show you a few things that will come in handy if you want to prepare for your dream job. After downloading the free template, you will receive a Word document that shows you what things you should focus on to land that job you want. All employers require the same things for employment, the resume, cover letter, and a few other basic items. This template lists them all and then some to put you above and beyond the standard. If you’re ready to get started today, just follow the link at the bottom of this page to begin. After clicking the link below and downloading the free template to your computer, click the file to open the page and start reading over the template. You will begin at the top of the page and read the information that’s been given. As you read each item make sure you complete the item that’s been listed. As you scroll further down the list, you’ll notice that the items pertain more and more to getting the job you want and the first items are for preparing you mentally. To start, the template recommends you do some research on the job you want and make sure you know all the facets of that position. 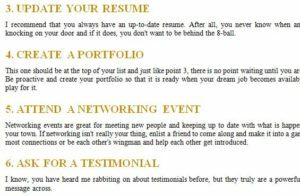 In the middle of the document, you’ll start to see familiar things like resumes, portfolios, and testimonials. Finally, near the end f the template, you will see ways to set up alerts about similar job positions, follow up actions to take after an interview, and much more. If you’re ready to get started with the free 32 Things You Can Do To Improve Your Career, simply follow the link below.